..appeared in Undead Nightmare, especially the more sympathetic members like Sean, Hosea, Lenny, Molly, Susan.. Arthur? I imagine that it would be really hard for John to put Arthur back to rest after all he's done, let alone even seeing him in that state, as a brainless, murderous monster. How would he react to the other reanimated members? well i would be okay with bringing back the deceased members. but i would not want john to be the protagonist. dont get me wrong john is a good character. but i think we have had enough john as a protagonist. 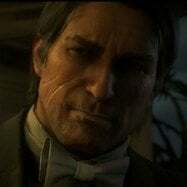 arthur deserves to have his own singleplayer dlc story. I don't want an Undead Nightmare DLC. That would be horribly sh*tty. I want a normal story DLC. "You mean I gotta f*ckin kill Micah AGAIN!?" Yeah..... Now back to our regular programing. BUY MORE GOLD BOAH AND YOU MIGHT GET RED DEAD ONLINE UNDEAD NIGHTMARE.